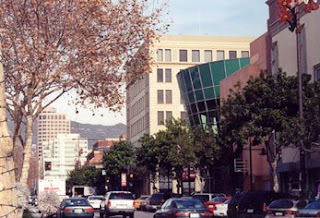 Glendale has the largest population of Armenians in the United States. This past week, the Armenians commemorated the Armenian Genocide—between 1915 and 1923, about 1.5 million Armenians were killed (out of 2.5 in the Ottoman Empire) by the Turkish government. Modern-day Turkey does not recognize the term "genocide" as an accurate description of what happened, and this is a point of contention between the Armenians and the Turks nearly 100 years later. Since we were in Glendale, we had an Armenian waitress at the Armenian-run restaurant. WAITRESS: And for you, sir? GABRIEL: I think I want the Yogurt Kebab. Now this sounds kind of like this Turkish dish I had once. Is this like that Turkish dish? 'Cuz it sounds an awful lot like that Turkish dish. WAITRESS: I don't know. (Pause.) I've never had Turkish food. LOREN: I'd love some coffee. The kind that's poured out of that special container. I think it's Turkish Coffee. Is that right? Turkish Coffee? Yeah, I think I had the Turkish Coffee the last time I was here. WAITRESS: I don't know. (Pause.) We have Armenian Coffee. ...Now I'm sure that not all Armenians hate the Turks and not all Turks hate the Armenians, but, in the same week that the Armenian Genocide is being remembered, do you really want to be the only two white people in the restaurant who put that theory to the test?